I draw because I am a visual thinker, like many (certainly not all!) autistics. My natural, most basic, automatic mode of processing is not linguistic; it is visual and conceptual. I have developed an incredibly fast processing speed for translating images to language and vice versa, but it is still a translation process. I don't learn well from aural methods of teaching, and that is probably exacerbated by auditory processing difficulties. If I am in a lecture classroom where the mode of teaching is the professor standing in front of the room and speaking for an hour, expecting students to absorb the information and later process it into their existing frameworks, I will not retain the vast majority of the information. I will remember only some of what was said, and not most of the substance. That is, if I weren't drawing. When I draw, the act of drawing serves as a mediating process between the auditory teaching style of the professor and my baseline mode of processing thought. I draw to help process my emotions. I draw to help process conceptual material that I'm supposed to learn. I draw to help release anxiety. I draw because I find myself so thoroughly engaged with the movement of pen against paper, cross-hatching, shading, etching lines and contours against the background, that it enables me to understand the world around me and yet produce something in return. "Hi, Professor Muhammad, can I talk to you for a minute?" "So, you may have noticed me drawing in your class. I just wanted to let you know that when I do that, it's to help me pay attention. I don't mean to be disrespectful or rude, so I just wanted to tell you that I need to draw in order to retain the information." "Okay, fine, that's no problem." Those are the better conversations. There are also the worse ones. "Lydia, can I talk to you after class?" "You've been very rude and disrespectful. You come to class and it's like you check in and then check out. I see you drawing there all the time." "I'm sorry if I've come across that way, but I do think I talked to you earlier in the semester, and I don't draw to be disrespectful or rude or to ignore you. It's not that I'm not paying attention; I can't pay attention unless I'm drawing." "You must never pay attention." And then there was the time a marshal asked me why I was being rude in court and demanded to know if I had a legitimate reason to be present (I did) because I was drawing. In the back row. Quietly. If someone needs to sit on the floor to listen, let them. If someone needs to pace around the room to listen, let them. If someone needs to look anywhere but at your eyes to listen, let them. If someone needs to flap their hands or arms to listen, let them. If someone needs to draw to listen, let them. Compliance is the dominant ideology. If we don't still our hands and feet, sit straight in our chairs, and look the instructor (or whomever is in the position of authority) in the eye while we listen in silence, then we are not learning. We are deemed incapable of learning. This paradigm must shift toward one that accepts and encourages many ways of interacting with space, with one's own body/mind, with the world around oneself -- toward a paradigm that understands and respects the ways that we move and think and sense and learn naturally. If your student or your employee or your friend is drawing while someone else is talking, don't assume rudeness, inattention, or disrespect. I promise I'm doing my work and I promise I know what I'm doing. I might even tell you about the drawing if you ask. Here's a drawing I did while performing an auditory-information-heavy task at work this summer. I completed the drawing over a period of three days, working on it for several hours each day. Image description: This is a black and white drawing. I used a black roller ball pen (the same one I use for notes and homework). 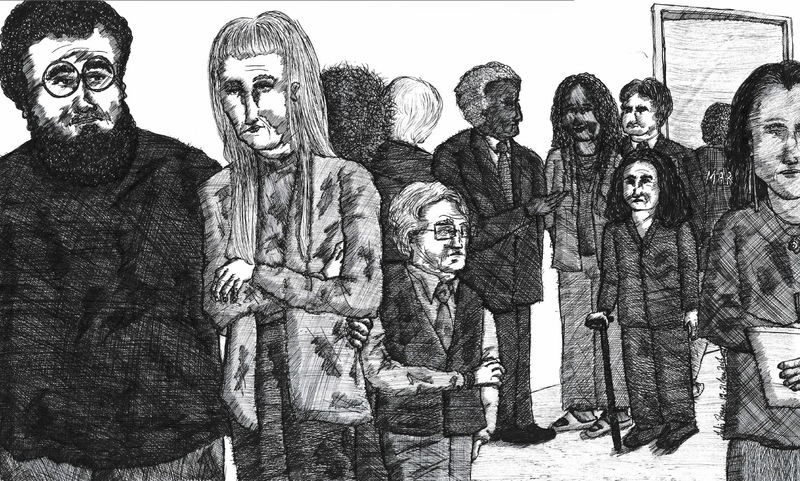 The drawing depicts a group of people standing in a hallway. The two leftmost figures are a tall, middle-aged white man and woman. The man has thick, dark curly hair, and a big bushy beard and mustache. He is wearing round glasses and looks pensive. He has a dark shirt and slightly lighter pants, and has his arm around the woman's waist. The woman has straight, fair hair that falls to below her breasts, and she is staring forward with her arms crossed. She is wearing a light-colored turtleneck with a lighter colored sweater/wrap over dark pants. Behind these two people, to their left, and center of the picture, is a short, older white man with white hair combed back, wearing rectangular glasses, a medium-colored tie, a collared dress shirt, and a dark vest over medium pants. He is holding his left arm with his right hand and is looking toward the right-hand side of the picture. Behind the three of them is the back of a woman's head with short, poofy hair, wearing dark clothing. Behind her is a person wearing dark clothing with their back turned to the viewer, with very light-colored hair. Behind and beside that person is an older Black man with short, curly gray hair, wearing a dark suit, light dress shirt, and medium tie, signing "what?" with his right hand and forearm extended in front of him. To the right of him is a younger Black woman with bust-length curled hair, wearing a light-colored pantsuit, dark shirt, and multi-layered necklace. Slightly in front of her is an older white woman with short, dark, shoulder-length hair, wearing a dark pantsuit and leaning on a dark cane in her right hand. Behind both her and the Black woman is a middle-aged white man with bushy dark hair, also wearing a dark pantsuit and tie. To the rightmost of the picture, in the foreground, is a dark-complexioned woman with long dark hair and a widow's peak, wearing long metal earrings, a pendant around her neck, a dark long-sleeve shirt, and a skirt. She is holding a notepad in her left hand and writing with her right hand. Behind her is a person with short curled hair wearing a dark jacket that says MARSHAL on the back, entering a doorway leading into another room or hallway. This is an illustration of a scene in my current, seventh novel. The man farthest to the left isn't a major character in the novel, or at least, not the central one. But I've noticed that when I grab a pen and start drawing, if I'm not doing so intentionally and deliberately to depict a particular person or scene, I begin to draw him. I've memorized the contours of his face, his hairlines, his expressions, the variations on his facial hair. His image is a comforting routine, a certainty, one my hand knows intimately and expertly. His face appears throughout the pages of my notebooks and pieces of scrap paper I collect at conferences. His image is so common among my things that my friends now recognize him. They know his name. They know which novel of mine he's from. They know his face. After all, I draw it all the time. I should also note that I draw for fun. But I suppose I should expect my drawing to be pathologized anyway. It's already a marker of my non-compliance. And for that reason, when I draw, it is sometimes dangerous. This, so much this!! I can't take in anything auditory without doing *something* visual (but that isn't writing, since I'm dyslexic and can't process anything auditory at all when trying to write). So I find myself knitting or playing video games while listening to my screen-reader read things to me. I'm the exact opposite I suppose. I process things strictly in a strictly auditory way. I have to bury my face into my arms so no light can get in while I focus and listen. Seeing things while I'm listening just slows me down. I have attended conferences that I remember for years, because they employed a "graphic historian" who posted butcher paper all around the room, and drew images of the discussion. At the end of these conferences, the graphic historian was given 10 minutes or so to review what had been discussed at the conference, but going to his drawings. It was so amazing, helpful, and really made the topics or ideas "stick" in my head. I loved it. I love this post, too. I am a psychologist, and think every psychologist should read this. I write to process things. I've got in trouble, too, for not looking at the person speaking, for writing too, fast, for folding paper too loud. I can relate to this very much. Drawing helps me focus... and listen... and be quiet... and sit still. Thank you - and I love your fabulous drawing! This just sparked a memory for me- when I initially began talking to my psychology teacher about getting treatment for my mental health problems, she mentioned offhand that she had never had a student sit in the front row, flipping back and forth between notes and a full-page, full color chalk drawing- which was my standard operating procedure in her class. Now it turns out that my difficulties may be rooted in mild Aspergers. Guess I found another possible trait! This brought up a memory for me. When I began to realize I needed help for my mental and emotional difficulties, I went to my Psychology professor. During our conversation, she mentioned that I had very much perplexed her, initially. She had never had a student who deliberately sat in the front row sit there daily flipping between drawing (full-color chalk works) and taking detailed notes. Now it turns out my stuggles are most likely rooted in mild Aspergers. Guess I just discovered another trait!